Our most recent edition of MUN focused on reinforcing one of the central themes of the UN itself: Unity in Diversity. As many as 360 students from over 10 schools, 3 private delegations, individual delegates from CHIREC and other schools and junior colleges of Hyderabad participated in the event held in July. The guest for the day was Mr. Andrew Fleming, the British Deputy High Commissioner, Hyderabad and Ms. Ridhima Peravali, Knowledge Economy Advisor at the British Deputy High Commissioner`s office. The event lasted for 3 days, with the delegates discussing key issues such as nuclear disarmament in DPRK, prevention of violation of rights of prisoners of war during conflict, trial of Pakistani prisoners of war, reassessing the NATO strategy against an emerging Russian power, the South China Sea dispute and the humanitarian crisis in the Middle East. On Day 1, the delegates were introduced to various committees such as the Disarmament and International Security Committee, the Human Rights Council, the United Nations Security Council, the North Atlantic Treaty Organization, the Joint Crisis Committees, the World Humanitarian Summit 2018 and the International Court of Justice. The executive board began formal debate and the reporters wrote articles on how the committees proceeded, while the photographers captured the delegates` emotions during the discussions. 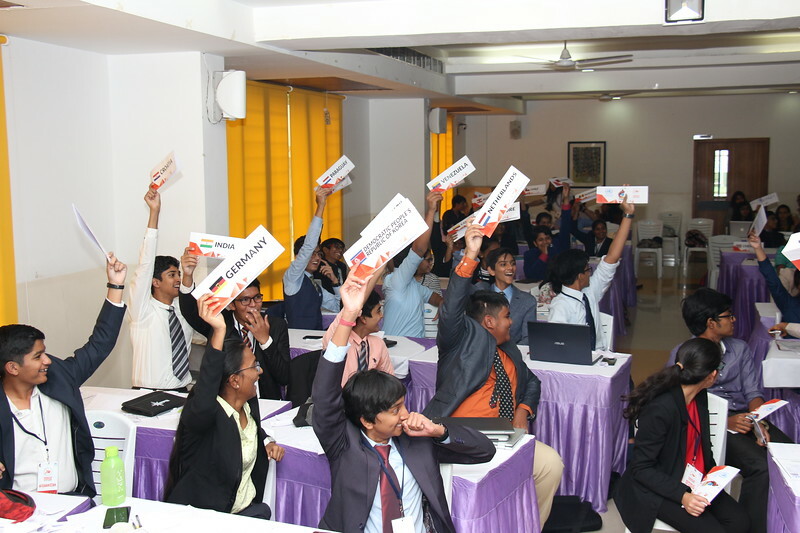 Day 2 saw the delegates choosing sides, forming blocs and sticking by their allies on the various issues at hand. The agenda was properly thrown into light as the delegates were interviewed for their positions. On the final day of MUN, press conferences were conducted, with the delegates defending their stances. Resolutions were drafted and a formal vote was tallied. Under the community outreach programme, 14 students from Devnar School for the Blind participated in the CHIREC MUN`s World Humanitarian Summit. These students spent three weeks preparing for the event, alongside a team of twelve students from CHIREC, and performed exceptionally as they spoke, heard and resolved as part of a committee of nearly a hundred participants. The conference was concluded by presenting awards to delegates for exceptional public speaking, debate, and negotiations. 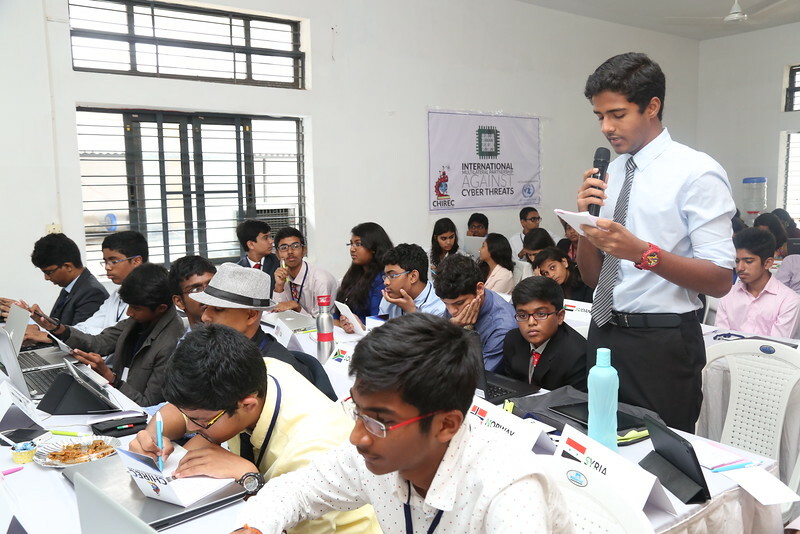 The 2nd edition of CHIREC Junior Model United Nation Conference (JMUN) conducted for students of Classes 6 to 8 took place from 2nd to 4th November 2018 at the CHIREC Kondapur Campus. 320 delegates from CHIREC and 10 other schools registered for the 3-day conference. The chief guests, Dr. Chaitanyamoy Ganguly and Brigadier Mangesh Vitekar inspired the delegates and emphasized the need for seeking knowledge, rising above and making a better world for tomorrow. CHIREC JMUN 2018 featured eight committees, from labor laws to intergalactic threats. Students enthusiastically debated foreign policies and formulated important resolutions. Delegates were presented awards based on their performance in various aspects of public speaking, debate, and negotiations. 350 student leaders from various schools across Hyderabad participated in CHIREC MUN 2017, organised in collaboration with the United Nations Information Centre for India and Bhutan. Mr. Harpreet Singh, Principal Secretary to Governor, and Mr. Ajit Rangnekar, Director General at Research and Innovation Circle of Hyderabad inaugurated the event. As part CHIREC’s community outreach program, 16 students from Devnar School for the Blind and the Kasturba Gandhi National Memorial Trust School were invited to participate. The three-day affair saw delegates discussing issues relating to different countries, in seven different committees including the UN High Commission for Refugees, All India Political Parties Meet, AEGIS, Historic Security Council, White House Situation Room and Commission on Narcotics and Drugs. 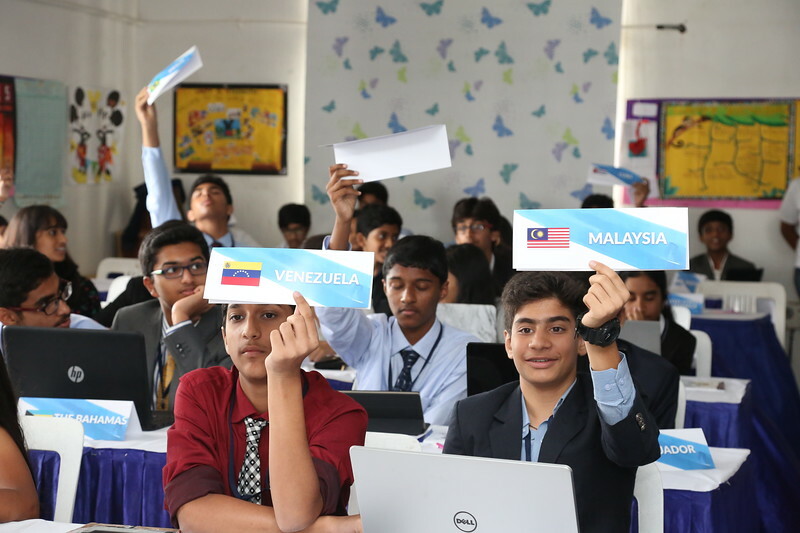 The Junior Model United Nations was started to empower young student delegates with skills in diplomacy, international relations and to come up with innovative solutions to issues faced by different countries in the world. 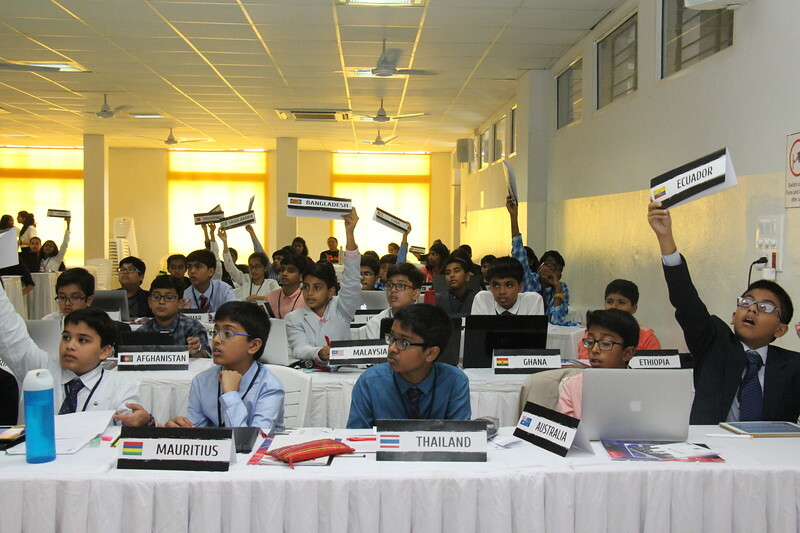 The first CHIREC JMUN hosted students of Classes 6, 7 and 8 of 8 different schools from Hyderabad from 27th – 29th Oct 2017 at the Kondapur campus. The inaugural ceremony began by welcoming the chief guest Ms. Vanitha Datla, Vice Chairperson of Elico Ltd., a pioneer in the Analytical Instruments Industry. She motivated the young and innovative minds to participate in the UN governance model, gain the skills to thrive in a place of challenges, offer recommendations and to empower the vision to influence perspectives and world policies. She especially encouraged the girls to come forward with their views, to facilitate reduction of inequalities in world policies. She also spoke about 6-ups on becoming a good leader - Show-up, Speak -up, Look -up, Team -up, Don`t Give-up and Lift others up. As many as 400 student leaders from various schools in Hyderabad, Pune, Bengaluru, Chandigarh, Chennai, Delhi, Vellore and Dadri participated in the conference. As part of CHIREC MUNs community outreach program, students from Devnar School for Blind and the Kasturba Gandhi National Memorial Trust School were also invited to participate. 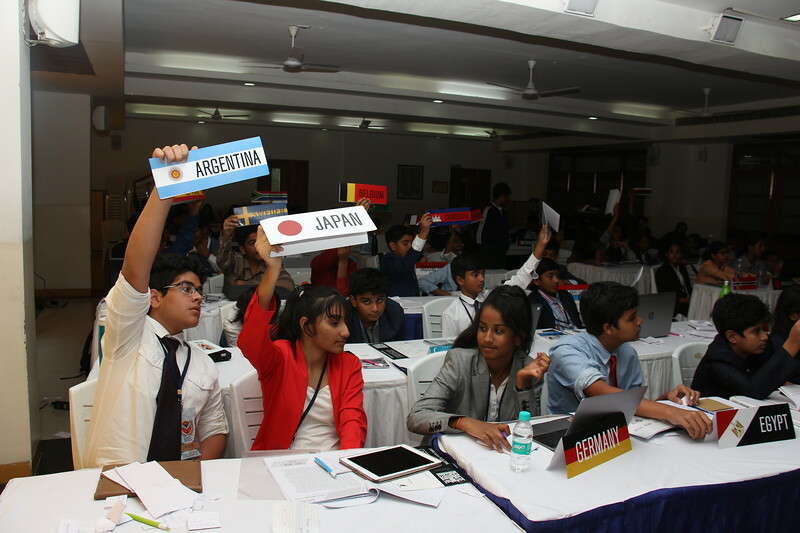 Delegates formed UN committees representing 193 countries and participated in committee sessions. Sessions were conducted on The Korean War, in a 5 cabinet JCC and Russia vs. Ukraine in an ICJ committee in collaboration with NLSIU. Delegates also debated over current events such as cyber threats, terrorism, genetic engineering and the current political topic, Brexit. The event was inaugurated by C. Rangarajan, former Governor of RBI and Sivakumar Sethuraman, Head of Community Operations at Facebook India. The event concluded on a high note as students from The Devnar School for the Blind expressed announced their plan to host their own MUN in the presence of Mr. N.V.S. Reddy, MD of the Hyderabad Metro Rail and Mr. D. V. Manohar, Chairman of the Hyderabad Bicycling Club and Founding Chairman of Shri Shakti Group as the Guests of Honor.